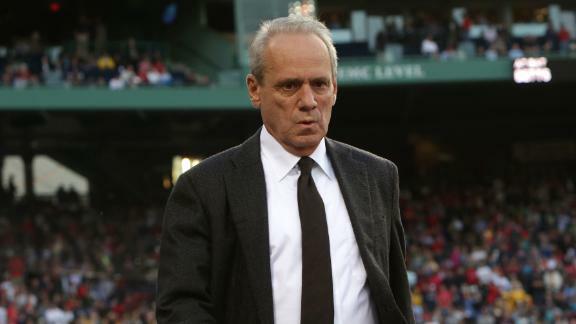 BOSTON -- Larry Lucchino, a baseball franchise-builder in three cities who oversaw three World Series titles in his tenure with the Boston Red Sox, is stepping down as team president and CEO at the end of the year, when his contract expires, a club spokesman confirmed Saturday. "I believe the end of this year is a good time for this change," Lucchino said in a statement. "We would have preferred to announce all of our transition plans at once, including my new role, but I can tell you we all feel strongly that Sam Kennedy, who has been with me for 20 years, should be the next President of the Boston Red Sox." The Boston Globe first reported that Lucchino was stepping down. Lucchino will take on a more strategic and less day-to-day role, according to a club source. Kennedy, a Lucchino protg and the team's chief operating officer, will replace Lucchino as club president and report directly to principal owner John W. Henry and chairman Tom Werner, the source said. Although news of Lucchino's decision surfaced the day after the trade deadline, at which the Red Sox did little to improve a ballclub headed toward its third last-place finish in four years, sources insisted the timing was coincidental and Lucchino was not being forced out. "[Red Sox owners] have been discussing this with Larry ever since they renewed Sam's contract in 2012, with the assurance he would one day become president at the appropriate time," a club source said Saturday. Negotiations on the terms of Lucchino's departure began in earnest this spring, according to an industry source, with initial plans to announce his departure around Opening Day. But Lucchino, perhaps reluctant to relinquish the job after 37 years in Major League Baseball, put off an announcement. Talks intensified this past week, with the club tentatively planning to make an announcement next week. "This has been contemplated for many years," Henry wrote in an email Saturday. "No surprise internally. Larry Lucchino is a Hall of Fame baseball executive who has left an indelible mark on Fenway and on the relationship between the Boston Red Sox and New England. We've won three world championships under his leadership and set the longest sellout streak in professional sports history. His accomplishments are many and will have a lasting impact." Henry extolled the promotion of Kennedy, a graduate of Brookline (Massachusetts) High School who followed Lucchino from San Diego, where he was the Padres' executive director of corporate partnerships and broadcasting. He was also among the first executives Lucchino brought with him from the Padres. In 2004, Kennedy helped create the Fenway Sports Group, which led to the purchase of the Liverpool soccer team and Roush Racing team, among other ventures. "Sam, for many years now, has been Larry's choice to eventually succeed him as president of the club," Henry wrote. "Sam has also been the choice of the partners comprising Fenway Sports Group. He is surrounded by a very talented group of men and women. "He has been a much-sought-after baseball executive over the past 10 years. At least one sports franchise a year has offered him their presidency, but he knew this day would eventually come. We are grateful that he stayed." Lucchino became CEO of the Red Sox upon purchase of the team by the ownership group headed by Henry and Werner in February 2002. Lucchino had a smaller financial stake. He previously served as president/CEO of the Baltimore Orioles (1989-93) and San Diego Padres (1995-2001). Lucchino was with the Orioles when they won the World Series in 1983, he was Padres CEO when San Diego went to the World Series in 1998, and he presided over the 2004 World Series title that ended Boston's 86-year drought, as well as subsequent championships in 2007 and 2013. As CEO of the Red Sox, Lucchino famously clashed with late New York Yankees owner George Steinbrenner. It was Lucchino who labeled the Yankees "the Evil Empire" in an interview with The New York Times. During spring training in February, Henry and Werner refuted reports that Lucchino's role was being reduced to allow Michael Gordon, president of the Fenway Sports Group and the second-biggest shareholder on the team, a greater voice. Speculation grew when a masthead on the team's website listed Gordon above Lucchino. Werner labeled that a "mistake," and it was subsequently amended. "I can understand the interest in palace intrigue, but there isn't very much palace intrigue to report," Lucchino said at the time. "Mike's role has evolved over time, and he plays a very helpful role." Lucchino acknowledged at the time that he envisioned taking a lesser role. "At some point, I'm going to slow down, but we'll just take it year by year, which is what we've been doing the last few years," he said. "Scale back appeals to me. Dropping off the face of the earth doesn't." Gordon, whom Lucchino cited for his role in negotiating a long-term contract for second baseman Dustin Pedroia, remains a key adviser on baseball matters, sources said, and is expected to serve as a sounding board for Kennedy, 42. Lucchino clashed with former Red Sox general manager Theo Epstein, who abruptly resigned in November 2005. As a condition of Epstein's return to the club a few months later, Lucchino played a lesser role in the baseball decision-making process. When Epstein departed for the Chicago Cubs after the 2011 season, Lucchino played a central role in the naming of his successor, Ben Cherington, and initiated the process that led to the 2012 hiring of Bobby Valentine as the team's manager. The club finished in last place that season, and Lucchino helped negotiate John Farrell's release from his contract with the Toronto Blue Jaysso Farrell could become manager of the Red Sox in 2013. That season ended with the team's third World Series title in 10 years. "Any money decision involving a player move still went through Larry on the way up to John," an industry source said Saturday. In spring training, Lucchino announced he was part of a 10-member group that purchased the Pawtucket Red Sox, the team's Triple-A franchise, with the intention of building a new ballpark in Providence, Rhode Island. In May, new Pawtucket president James S. Skeffington, a prominent Rhode Island attorney who had previously served as the Red Sox's lead counsel on real estate development, died of a heart attack at age 73. Since then, Lucchino has been spending more time dealing with Pawtucket issues. He was offered a significant role with the organizers of the Boston 2024 Olympic bid, but he declined and accepted an advisory position instead. The building of a new stadium for Pawtucket was the type of project tailor-made for Lucchino, who oversaw the building of Oriole Park at Camden Yards, the retro-style prototype for a wave of big league stadiums built in the past two decades. He also was involved in the planning of San Diego's Petco Park, which opened in 2004, three years after he left as CEO of the Padres, and he was a guiding force in the extensive renovations of Fenway Park, which previous Red Sox ownership had labeled antiquated and in need of replacement. The Red Sox have set an attendance record in each of Lucchino's 13 seasons with the club, and the team makes millions from tours of the ballpark, which has undergone a remarkable transformation, most strikingly with the placement of seats on the Green Monster. Lucchino was an attorney whose involvement in sports can be traced to his long association with famous trial attorney Edward Bennett Williams, who was the owner of the Washington Redskins when Lucchino became the team's general counsel and a member of the team's board of directors from 1979 to 1985. Lucchino often has cited Williams as his mentor, and he adopted Williams' philosophy of "contested living." When Williams bought the Orioles in 1979, Lucchino became the team's vice president and general counsel before he was promoted to president in 1988. A native of Pittsburgh, Lucchino was a teammate of Bill Bradley, the former New York Knick and U.S. Senator, when Princeton went to the Final Four in 1965. He has a Final Four watch from that season, a Super Bowl ring from his time with the Redskins (1983) and four World Series rings. The Baseball Tonight crew discusses the impact Larry Lucchino had as CEO of the Boston Red Sox.